This week, we hit Elizabeth Street this afternoon for lunch at Cantoon Garden ne Pearl River Restaurant ne New Pearl River Restaurant – just a block east of busy Mott Street, but somehow much quieter. Right at the top of the menu, one of the dishes caught my interest: the Braised E-Fu Noodle with Black Mushroom. E-Fu noodles, or yi mien, are flat wheat and egg noodles. After a process of boiling and cooling, the long strands are formed into flattened patties, fried and dried, which is how they are sold in Asian markets. As a result of this double-cooking process the noodles can be prepared very quickly, making them a staple in many Chinese restaurants: braised, stir-fried, or in soups. Because of their generous length — no cutting, please! — the noodles are considered a symbol of longevity, hence their popularity at birthdays, family celebrations and Chinese New Year banquets. 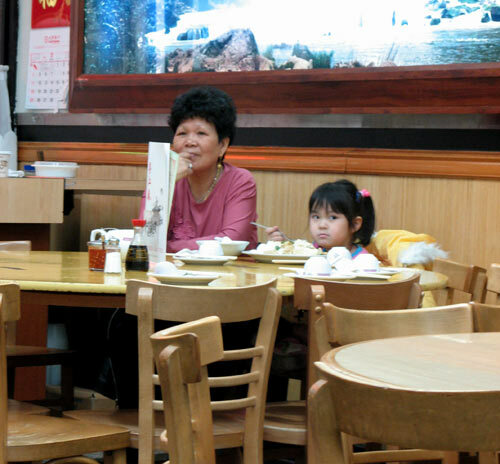 We knew the dishes were going to be very generous when we spied this little girl at another table, tackling a rice dish almost as large as her head. 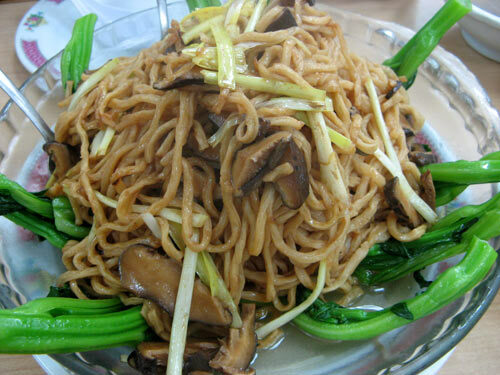 Great dish: chewy noodles, tossed with shiitake mushrooms and yellow chives and ringed with choy sum stalks — in fact, it’s the one recommended by the Village Voice, though we didn’t know it at the time.